Solid-state lidar – it’s a term that inspires unrecognizing shrugs from drivers at best. At worst, it provokes yawns of disinterest. But it’s arguably the most important technological development in cars in years – one that safety-conscious drivers definitely should know and care about. It’s going to be a core piece of many new vehicles, whether they have self-driving capabilities or not. And it’s about to go mainstream. The word “lidar” itself is a portmanteau that combines the meanings of “light” and “radar” into, well, a sort of light-based radar. A regular radar, used in planes, ships and cars for decades, detects its position and therefore that of its pilot or driver by emitting microwaves, which bounce off surroundings and relay back to a sensor at their source. The radar can thus paint a rudimentary picture of what’s around it and how far away those things are. Lidar works on the same premise, except it emits laser pulses – thousands per second – instead of microwaves. The lasers provide a more accurate picture than radar and can create three-dimensional images of the vehicle’s surroundings, effectively giving it a sort of robotic vision. Many companies experimenting with fully autonomous cars, such as Uber and Google’s Waymo, have been using lidar to help guide their vehicles as a result. By combining it with other detection technologies, including radar, cameras and infrared sensors, they’re giving cars multiple ways of interpreting their environments. Despite lidar’s advantage over radar, it has also had several disadvantages. Firstly, the system has thus far come in the form of a large spinning dome that sits on top of the car’s roof, not unlike the flashing lights found on police and emergency vehicles. Such systems have also had prohibitive and impractical price tags, generally running tens of thousands of dollars. At that cost, it would be impossible to install in any car that the average driver could afford. Enter solid-state lidar, which replaces the spinning dome with a box that can be inconspicuously installed in various locations around a vehicle. Given its small size – Velodyne’s Velarray system, for example, isn’t much bigger than a smartphone – it can be hidden behind a vehicle’s grille or incorporated into its head- and tail-light modules. A lidar sensor is seen on top of a self-driving car at the Renesas Electronics autonomous vehicle test track in Stratford, Ont., on March 7, 2018. Replacing most of the spinning parts with smaller mirrors also means the systems are more durable and less prone to breakdown and allows manufacturers to bring costs down dramatically. Quebec City-based LeddarTech, for example, says its new LeddarCore LCA2 system-on-a-chip product will allow auto makers to mass produce basic solid-state lidar units for less than $100 each. Higher-end units with better resolution can be produced for less than $300, the company says. Solid-state lidar’s main downside, however, is that a single unit can only capture a limited field of view. Because it no longer sits on the roof, auto makers must position several units around a car, which makes it more important for prices to keep heading downward. Lidar producers say they’re almost at that perfect spot where their systems are able to capture all the information auto makers need, for the right price point. “When we start doing mass-scale manufacturing, we should be able to do that,” says Parkin of San Jose, Calif.-based Velodyne. 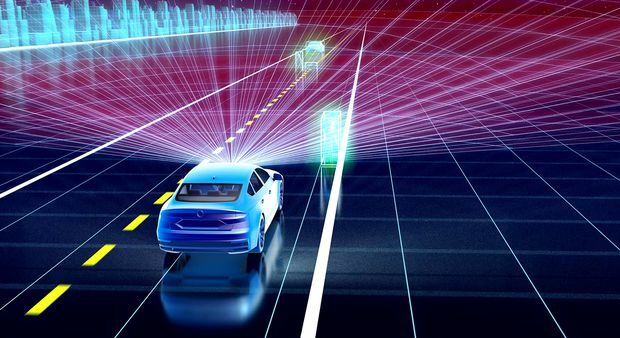 When that happens – producers expect it’ll be within the next year or two – solid-state lidar will likely see mass deployment, since its benefits won’t accrue to just autonomous driving. It is also expected to improve existing safety features, such as blind spot detection and rear-collision avoidance. Solid-state lidar will also prove necessary for Canadian drivers, technology experts say. Eliminating moving parts and shielding the systems from the elements within headlight modules will help them from breaking down.